3 The Five Golden Rings Were Actually Birds? 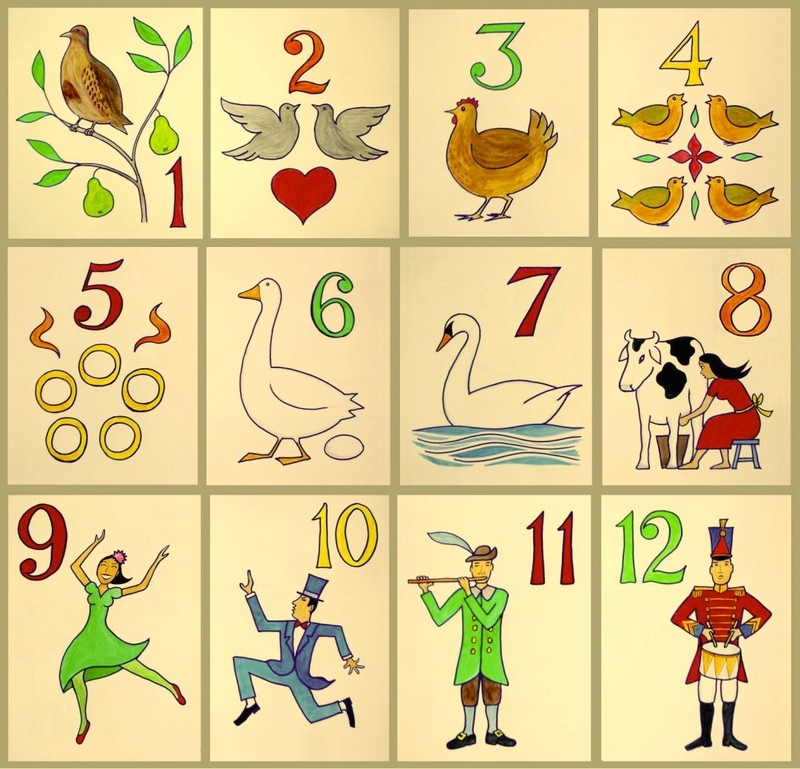 When we think of Christmas, one of our fondest memories is the English song 12 Days of Christmas. The song plays in our head about the different gifts one each for a specific day on 12 different days prior to Christmas. This song appeared in 1780 in England and was chanted to a rhyme. There was no actual melody originally. It may have even originated in France. In 1909, it was set to music by the Frederic Austin and is still sung in our homes today. The song is relatively easy for kids to learn because of the repetitive nature of the verses. It tends to be very popular sung in “rounds” for Christmas performances and school concerts at holiday time. Many a night has been spent around the fire at holiday time with families singing this song together. Read on to learn more about this very old holiday song. When you sing the12 Days of Christmas, you are singing a type of song known as a “cumulative song.” You build each verse on each previous verse, leading up to twelve verses total in this song. Then after you get to the end of each verse, you sing right back to the beginning of the verse. Every verse in the song represents gifts given by “my true love” on twelve consecutive days during Christmas week and the first week of the New Year, starting on December 26th and ending on January 6th. In Western Traditions of Christianity, these 12 days signaled the start of the Epiphany. When the wise men left to bring gifts to baby Jesus and the end of this period was January 6th. There is possible association that the days may represent the months of the year and each gift represents something significant for each month. Each gift may be a food eaten or entertainment for that particular month. For example; “The First Day of Christmas” may stand for the first month of the year, January as partridge or pheasant season ends in January. Other ideas may be that it may have been a weather prediction for the coming 12 months. In any case, some maintain the song has absolutely nothing to do with religion. One possible code bust is the possible relevance to the Bible when the Catholic faith was actually outlawed in England from 1558 to 1829. The song might have been created to help teach kids the faith at home. However, these claims were refuted when the argument arose that if decoded to be Catholic, all the items could be crossed over into the Protestant faith as well. For example; Two Turtle Doves (both use the Old and New Testament of the Bible), Ten Lords a Leaping (both faiths believe in the Ten Commandments). The only reference to Catholic beliefs is they celebrate the Epiphany period beginning on December 26th and ending January 6th. However, this is pretty widely acknowledged in a few Western Christian churches. The Five Golden Rings Were Actually Birds? There is a possibility that all of the first seven gifts were actually birds! Look at the succession; 1) Partridge, 2) Turtle Doves, 3) Hens, 4) Calling Birds, 5) Golden Rings 6) Geese 7) Swans. Since all of these are birds, it is very possible that these are the rings on the “ringed pheasant”, a goldfinch or possibly a canary. This idea was actually shot down when a notation was found in a book from 1780 with a picture of “gold rings” showing that it was very possible to be about actual rings. Since many myths about the song are unproven, each family can still sing it in accordance with their own beliefs about its origins. Whether to teach about faith, spiritual beliefs or just good old Christmas fun, the 12 Days of Christmas is a timeless song.